European lenders got a second-day boost after Donald Trump’s presidential win on speculation his term will lead to increased inflation and an easing of financial rules. The leaders of the rally that pushed Europe’s shares up for a fourth day were UBS Group AG and Credit Suisse Group AG, which get more than 35 percent of their revenues from the Americas. Shares of the biggest Swiss lender headed for their biggest surge since 2012, while Credit Suisse jumped 5.8 percent. Europe’s banks, which until recently were the year’s worst-performing industry in the Stoxx Europe 600 Index, are bouncing back as bond yields are rebounding from their summer lows, easing concerns over profitability. Trump’s surprise victory added to the optimism, with his promises of public spending fueling bets for higher inflation, while speculation grew that he’ll review the strict capital rules applied during Barack Obama’s administration. 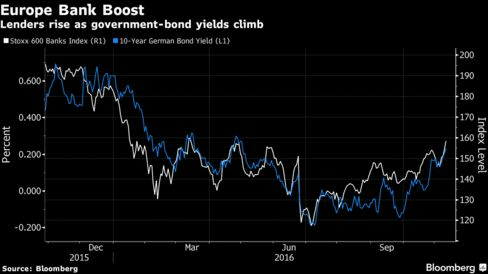 Bond-yields rallied, with those on 10-year German debt reaching a six-month high. Sentiment for the region is starting to turn, after its shares became the cheapest in four months relative to global equities. The Stoxx 600 climbed 1 percent at 10:10 a.m. in London, with the volume of shares changing hands double the 30-day average. On Wednesday, after uncertainty about the U.S. presidential election faded, a measure of the region’s equity volatility sank the most since August, while the Stoxx 600 erased a slump of much as 2.4 percent to end up 1.5 percent — its biggest turnaround since March. The rebound in banks is fueling optimism for the region, after a streak of 11 days with no gains, its longest since 1994. Economic data are beating forecasts, and analysts see a revival of profit growth for Stoxx 600 companies in the next three years. Fund managers began sending money to Europe’s equity funds again, after a record 38 weeks of outflows, a Bank of America Corp. report citing EPFR Global data showed last week. The gauge’s 4.3 percent jump in four days is putting it on track to post its biggest weekly advance since the rebound that followed the February selloff.